Frances Blake is an artist based in Dublin Ireland with many years experience in art. She is mainly a self taught artist although she has studied art at the National College of Art and Design in Dublin and worked with art groups in Ireland and in Toronto. Her speciality is painting murals for schools, play rooms, crèches, pubs, hotels, shops, etc. Children are welcome to help with the murals, it is a terrific activity to exercise their minds and it is such good fun for them! 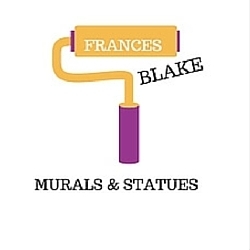 In addition to her mural painting Frances is an expert on statue painting and restoration. She provides excellent painting and restoration services for churches, convents, etc. and she will also fix that little chipped statue whose head has fallen off. Frances also does portraits, landscape paintings and illustrations. Her work includes acrylic, watercolour and oil painting and pen and ink sketching. She has an ongoing art class for adults on Tuesday evenings as well as children’s classes to Leaving Cert at the weekends. All classes learn to draw using pencils, pen and ink, pastels, crayons, markers, charcoal and paint using acrylic, watercolour and oil paints. Students learn still life, life sketching imaginative composition and design. In addition, Children’s classes include craft work, clay work and sewing including embroidery. Give Frances a call to book a class! 00353 86 893 2709 or simply fill in contact form below..